deine karte ist ein echter augenschmaus! This is so pretty! Thank you for joining us this week at Fab'n'Funky! So beautiful...Thanks for playing along with us at Fab'n'Funky this week. This is simply beautiful, this card is so delicate and elegant. I would like to invite you to join my new challenge blog http://cisforchallenge.blogspot.com/ and the first challenge, which is 'Flowers'. It would be a great pleasure for me. What a feminine and romantic card, so pretty! Thanks for joining our "Anything Goes" challenge at ATSM! 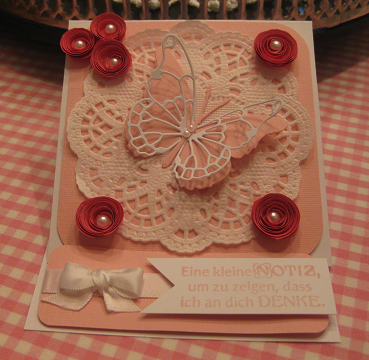 This is so pretty Beate - I love the butterfly and the lacy doily just finishes this card. Gorgeous little flowers as well. Thank you so much for joining us at Lady Anne's challenges this time, I do hope you join us again soon. Soft color, beautiful butterfly and super sweet layout. A stunning creation, thank you for playing along with Scrappers Delights Challenge blog. So beautiful and delicate. Thanks for joining us at Crafting By Designs. This is such a pretty card. Thank you for sharing with us at Ruby's Rainbow. So pretty! Love the gorgeous butterfly. :) Thanks for joining us at Make It Monday.